« What to Eat Before a CrossFit WOD??? CrossFit is all about doing whatever, whenever at anytime. 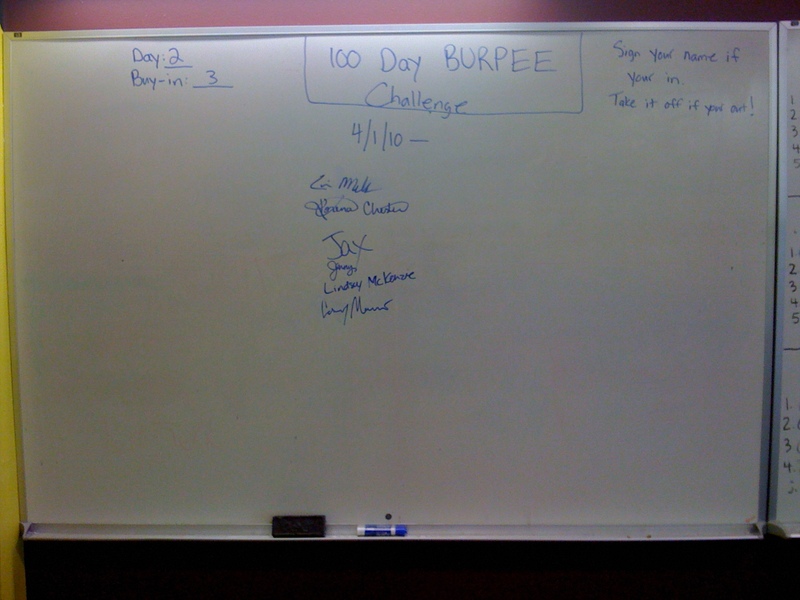 So we would like to introduce to you CFSF 100 day burpee challenge…That’s right not even with one day of notice. The reason: The CrossFit Games is exactly 99 Days from today. So actually it started yesterday:-))) Annie and I are in whose with us???! “Starting today April 6th all participants do one burpee, adding a burpee each day until reaching 100 burpees on the 100th day! All burpees will be done to CrossFit Games standard. 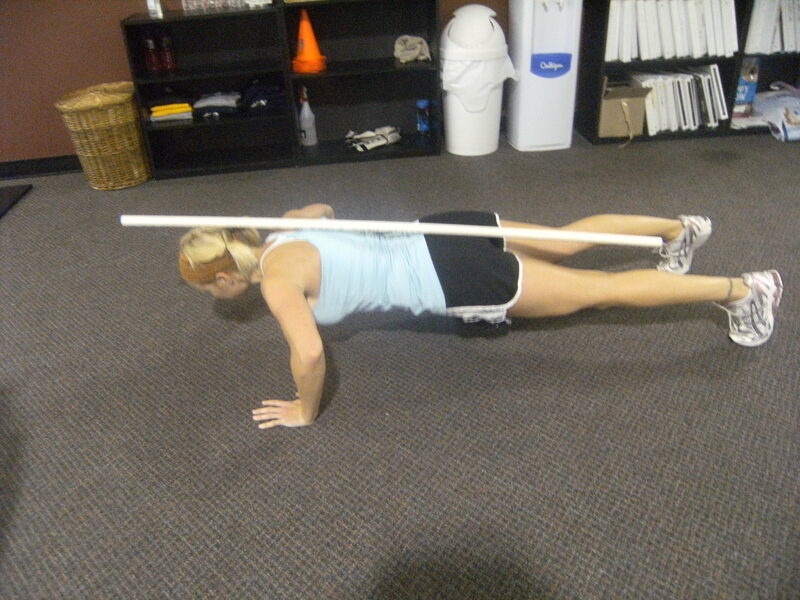 Each rep of the burpee will only count when full range of motion is achieved. The bottom limit is when your chest and thighs touch the ground. The top limit is when your hands clap overhead with your feet off the ground and your hips and legs fully extended. There is no height requirement on the jump, but the clap must occur while airborne. The clap is considered overhead when the arm crosses the plane of the ear (when viewed from the side). If the timing is missed, you may repeat the jump to complete the rep. This will be a tough Challenge and 100 days a considerable amount of time to commit, so lets get motivated and hold eachother accountable…before you know it, we’ll all be able to say we completed the “100-Day Burpee Challenge”!!!! This entry was posted on April 7, 2010 at 3:25 pm and is filed under Crossfit Philosophy, CrossFit Workouts, Lifestyle, Members. You can follow any responses to this entry through the RSS 2.0 feed. You can leave a response, or trackback from your own site. I’m definitely in! I’m also doing the 100 day pushup challenge as well, if anybody wants to join in! FYI – We’re going to be putting together a 100-Day Burpee Challenge Facebook Event to serve as forum to chat about everything Burpees!!! Motivation and accountability are huge factors in a Challenge of this length, so lets rally together and make this a great one as a group!!! I’m pretty excited about this…I’ve finally figured out the art of doing a burpee (which makes them much easier to do!). Thanks for the challenge! I’m totally in! I love burpees!! I am in! Did mine for yesterday! ROCK ON! This will be a good way to get my burpee form in tip top shape! Also- I want to know what the “art” of doing a burpee is…. Amy??? Couldn’t be any worse than Browny’s birthday WOD–I’m in! You know you love burpees, Roach!